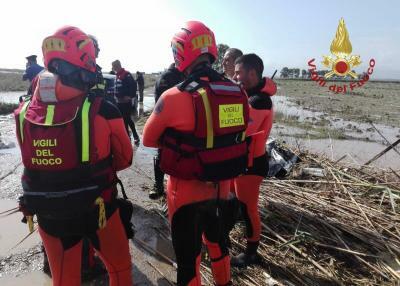 CAGLIARI – Devastating torrential rain in Sardinia has claimed a victim: a 45-year-old woman from Assemini, missing overnight after being swept away by floodwaters has been found dead, police officials said on Thursday. A team of police, fire fighters and civil protection personnel found the body of Tamara Maccario 400 metres downstream from the point in Sa Tria where she and her family had been separated. Their ordeal began at around 2.20 am this morning when the vehicle Mrs Maccario, her husband and their three daughters were travelling in was engulfed and carried away by floodwaters. Rescued by military helicopter, Mr Maccario was flown to the town of Decimomannu while the three girls were picked up by police and firefighters. Police divers are recovering the woman’s body.